The RIDGID Model 300 Power Drive is an electric motor driven machine which centers and chucks pipe, conduit and rod (bolt stock) and rotates it while threading, cutting and reaming operations are performed. Forward (clockwise) or Reverse (counterclockwise) rotation can be selected with the FOR/OFF/REV switch and a foot switch provides ON/OFF control of the motor. The threading, cutting and reaming operations can be performed by conventional hand tools or tools designed for mounting on the Power Drive. A manual oiling system is available to flood the workpiece with thread cutting oil during the threading operation. Geared Threaders can also be used with the Power Drive to thread larger diameter pipe. The RIDGID Model 300 Power Drive can also be used as a power source for roll grooving equipment. Designed to attach to the support arms of the Power Drive, the roll grooving equipment forms standard roll grooves on a variety of pipe sizes and materials. 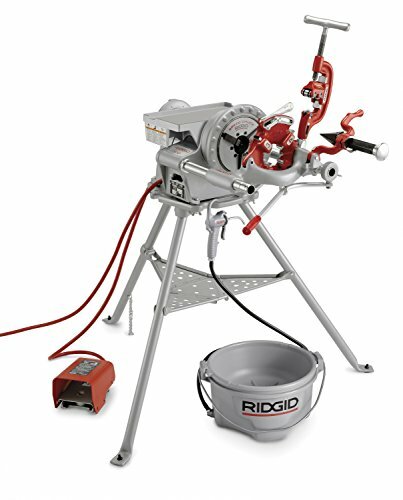 The RIDGID 15722 includes: RIDGID Model 300 Power Drive (57 RPM) pipe threading machine, Carriage with Lever, R.H. NPT Die Head Quick-Open, 1/2-inch to 3/4-inch Universal Alloy Die Set, 1-inch to 2-inch Universal Alloy Die Set, Model 360 1/8-inch to 2-inch Full Floating, Self-Centering Cutter, 341 Reamer, Stand 1206, Oiler with One Gallon Premium Thread Cutting Oil, #32 Transport Cart, Clip-On Tool Tray, and Operator's Manual. And has the capacity for 1/8 to 2-inch pipe, 2-1/2 to - 4-inch (65mm - 100mm) with 141, and 4 to 6-inch (100mm-150mm) with 161 Geared Threaders, and 1/4 to 2-inch (6mm - 52mm) Rod. Can be used as a power source for roll grooving equipment to form standard roll grooves on a variety of pipe sizes and materials.